With phase three of the Marvel Cinematic Universe drawing to a close, the studio seems to be having its best time ever with their tried and tested characters such as the Avengers as well as new ones like Black Panther, all of which are setting the cash registers ringing. But the same can’t be said about Marvel characters owned by other studios. 20th Century Fox’s Fantastic Four (2015) was a catastrophe and after the below-par X-Men: Apocalypse, it was the Deadpool series and Logan that bought them back on track. On the other hand, we’ve got Sony Pictures who messed up the Spider-Man franchise (Andrew Garfield’s Amazing Spiderman series) only to collaborate once again with Marvel to give us the Tom Holland starrer Spider-Man: Homecoming which is a part of the Marvel Cinematic Universe unlike Sony’s other Spider-Man based characters such as Venom. 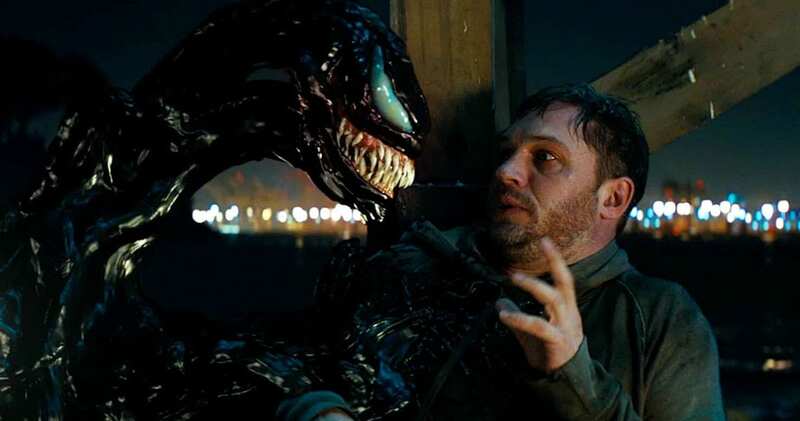 So considering how the Tom Hardy starrer Venom – the story of an antihero who, according to the comics, is one of Spider-Man’s archenemies – isn’t actual Marvel Studios property (who’ve been the pioneers of making films suitable for everyone), this film’s director, Ruben Fleischer, wanted to make it an R – Rated (A certified) one. After all, Venom’s ultimate killing style is to bite people’s head off and considering the above-mentioned examples, Logan and Deadpool series taking the R – Rated route, it also sounds right in trend. But that’s when the studios pulled the strings and made it into a milder version with toned down violence, which incidentally happens to be my problem with this film. An origins story, Venom shows how four symbiotic life forms make it to Earth after a manned spacecraft crash lands in East Malaysia (because the USA is too passe). While one makes its way to Eddie Brock (Tom Hardy), the rest gets in the hands of the villain Carlton Drake (Riz Ahmed) who actually sounds like a revelation in the beginning. While villains in superhero films usually covet the destruction of the world, Drake is someone who tries to save mankind, knowing about the impending doomsday. Why is he the bad guy then? Well, he plans on bonding symbiotes to humans to evade the danger. Apart from that and a few quirky one-liners, Venom is full of everything that Marvel has fed us for a decade now with this film adding nothing new to the list. Apart from the fact that comic-book fanatics expected the film to be darker, the expectations for Venom skyrocketed even amidst those who don’t follow Marvel, thanks to a stellar cast. While Tom Hardy scores in a couple of scenes – especially the ones in which he converses with the Venom symbiote inside him – Ahmed is reduced to a wannabe Lex Luthor. Michelle Williams who plays the role of Anne Weying doesn’t have much to work with. The film, at some point, makes one wonder if Hardy deserved better than the one-note character written for him. Though Sam Raimi’s Spider-Man 3 didn’t match up with the first two instalments of the Tobey Maguire starrers, the director’s representation of Venom as a ruthless parasite was much spoken about. But what we get in this film is a creature that cares about its host, and is even witty enough to have a rap battle with Deadpool. While this does result in some funny moments, that’s not what you would expect out of a Venom film. Though the action sequences are aplenty, the gore factor is as minimum as it can get. Probably the forty minutes that were removed from the film as Hardy mentioned recently might have everything needed to make this film work. On the other hand, fans do get to rejoice thanks to quite a few easter eggs. We get to see other symbiotes such as Riot and She-Venom and the post-credit scene (yes, there’s one) also holds a surprise. There’s also a Spider-Man reference in the form of a mention in the name of ‘the Daily Globe incident’ and even a kryptonite reference. Hardy’s matured looks fit in perfectly for a fordone journalist who has seen his better days. What also worked for me is Venom’s looks. As they can’t use the iconic white spider logo on a black coloured Venom, they’ve resorted to using white coloured veins which show it to be muscular, as well as solving the problem of being shown visibly in darkness. On the whole, Venom is the amalgamation of all the run-of-the-mill tropes you’re tired of watching in a superhero movie only to be packaged as something new. Considering how Venom is meant to be the opposite of our friendly, neighbourhood Spider-Man, let’s hope that the sequel takes the darker route.